Gourmet on Gore kicks off Friday, Aug. 31, with the Tasting Tour, which will benefit Vail Veterans Program. The four-day culinary festival wraps up Monday, Sept. 3, with the Brunch Off Bridge Street. Many events are free, with a pay-as-you-go format. 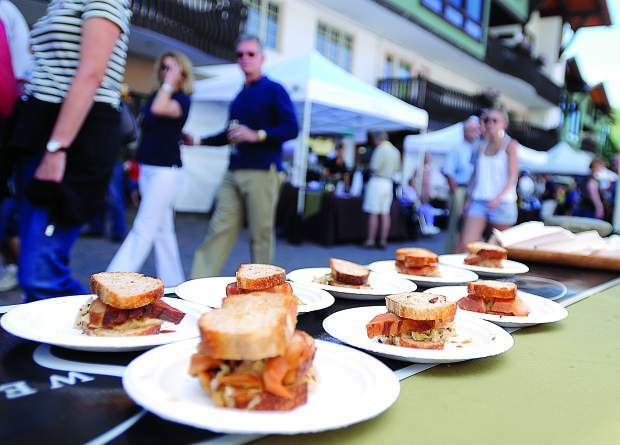 The 13th annual Gourmet on Gore will return for four days of culinary magic during Labor Day weekend in Vail. The open-air culinary event Aug. 31 to Sept. 3 brings together world-class wine, beer and spirits with impressive local cuisine in the streets of Vail. While the open-air tastings remain a popular item on the schedule, two new programs will take attendees from the streets of Vail Village to the trails and paths of town, creating a “best of both worlds” experience. Gourmet, Let’s Go programs offer the opportunity to combine outdoor activities while sampling from Vail restaurants. Opportunities include a community yoga as well as a culinary cruiser ride and a trail-to-table trek. The U at Gourmet on Gore will take place on Gore Creek Promenade in Vail Village on Saturday, Sept. 1. The educational program includes 30-minute workshops on a range of topics, from how to pair beer with dinner to exploring the nuances of Belgian chocolate. The seminars are free on a first-come, first-served basis. New this year, Rose by the River (weather permitting) is a chance to sample rose wines from around the world in styles from still to sparking, and including the popular frose. The 2018 event will kickoff with the Tasting Tour on Friday, Aug. 31, which will benefit Vail Veterans Program; tickets are $75 and are available for purchase online. The open-air tastings take place on Saturday and Sunday with complimentary admission and pay-as-you-go bites and pours. The free seminars at The U at Gourmet on Gore will take place on Saturday and the ticketed excursions hosted by Gourmet, Let’s Go will take place on Saturday and Sunday. Monday’s Brunch Off Bridge Street, which follows the same pay-as-you-go format, will close out Gourmet on Gore for 2018 on Sept. 3. For final details and the full schedule of events, visit the Gourmet on Gore website at http://www.gourmetongore.com.